COD? With much to like, 24ac – ‘The Cross-Dressers’ Banquet? (2,6)’, solved only after a long – ‘should that V really be there?’ moment of bewilderment. After struggling badly with yesterday’s offering, it was a much needed relief and confidence boost to finish today’s without too many problems. That said the RHS fell a lot more readily than the rest, causing a moment of doubt. The wordplay in 12d looked rather convoluted, so I just ignored it and hoped the checking letters would reveal all, which thankfully they did. A rare outing for ‘your’ rather than ‘ones’ in 5d. COD? With lots to enjoy as ever, 13ac – ‘Afternoon snack consumed by Frenchman mostly (6)’. Unnaturally warm weather descends on the UK, and with it Lato’s latest offering. Can we cool down long enough to make sense of the preamble? Think straight to solve the clues? No gimmicks outside of the thematic definition only ones, where we have misprints, and a resulting phrase. Highlighting at the end. Onto the clues, which at first glance look tricky. Only two on the first pass through, but that’s evidently dehydration because on closer inspection they’re perfectly solvable, with only a handful of question marks. The thematic clues less so. Some of the answers have fallen, but sorting out the misprints turns out to be a matter of ploughing through the big red book looking for likely definitions. Who would have thought eleven clues would take so long to sort? We’re looking for a two word phrase, so with a load of the misprints in place we can start to guess, and eventually (two days later, I’m telling you) there it is: LETTER PAIRS. So what needs to be added to the thematic entries? The above mentioned letter pairs. OK, so my first guess at LAY being a bats’ refuge is wrong, and we’re looking at LAY-BY, KAVANAGH-QC, PG TIPS, JR EWING, GEORGE VI, WH AUDEN, AT ISSUE, DU BARRY, SIXTEEN OZ, LE FIGARO, CLASSIC FM. What are we missing? K, N, S and X evidently. Though what to do with them? Highlight words in the grid containing those letters? That’s not going to work. What does the preamble say – “reportedly”. Sounds like? Highlight EXCESS and CAYENNE and we’re done. Now to bake in bed for a couple of hours. The heat wave is forecast to last how many days? I don’t recall Morph being much of a one for themes, but it being Tuesday there is one with a number of linked clues loosely based around 21d and 14ac. Please see the original February 2013 Fifteensquared blog for much hilarity and a reminder of how very topical this combination of subjects was at the time. The more you look, the better it gets. This setter can be relied upon for a fair old tussle, and it was a matter of a slow start with heavy going, gathering pace until the dash for the finish line in the final furlong. My last ones in were 16d and 25ac: a sneaky pair. Regarding 11ac, I assume that another venerable and relevant anagram came readily to everybody’s minds? Full marks to Morph for resisting the temptation. A pretty gentle, enjoyable start to the week again, with perhaps a little pause for thought on 23ac and 7d. I must admit to not spotting the wordplay for 16d despite seeing variations on it several times over the years. Over on the other side the consensus seems to have been that this was on the tricky side for the Don, but it seemed about par to me. Perhaps less obscure answers even than we sometimes get. 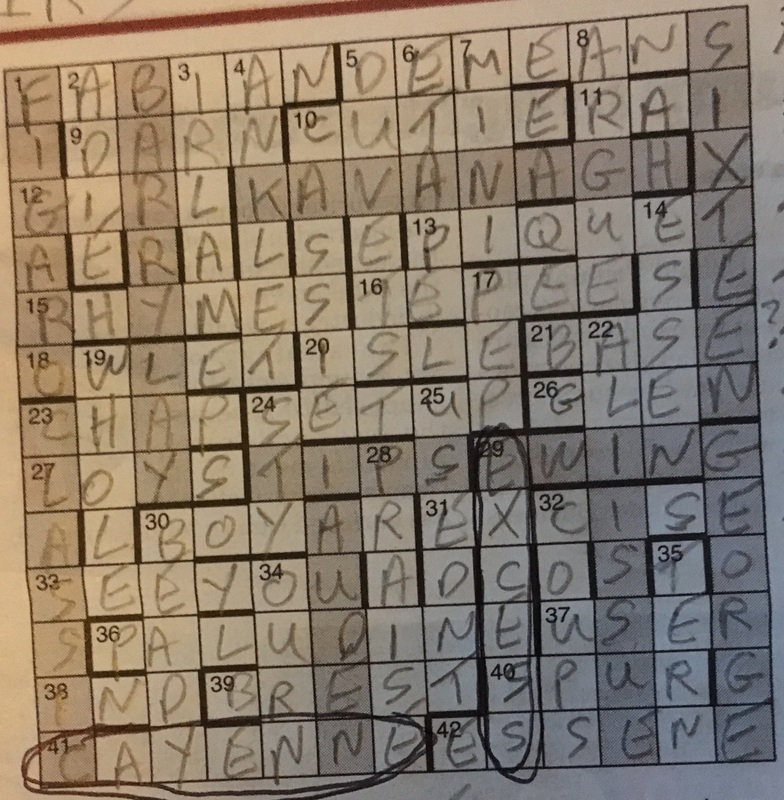 I was cruising along thinking this was going to be a breeze until I hit a bit of a brick wall on the last few – 12a, 26a, 2d and 24d which were stubborn enough for me to abandon the paper for a later sitting – whereupon all miraculously became apparent. Funny how that happens. Phi gave us an especially ingenious grid fill: In case you didn’t notice, every answer started and finished with the same letter. I love that sort of thing, as is evident in a rather less original way in the few puzzles I’ve compiled myself (tenuous excuse for plugging my next in the Indy on-line, this coming Friday). With some trepidation (people who live in glass houses and all that) I can’t help wondering if anyone else found some of the surface readings a bit clunky – by Phi’s normal standards that is? 11a seemed uncharacteristically so, for example… Or maybe it’s just me. It’s 11.30 and still no sign of the original blog being restored to Fifteensquared, so I’ve quickly rattled off my parsings. Apologies for any errors. 8 AGENDA – gen inside ADA – presumably a computer language ? The only quibble I can see with this puzzle is 5ac not being updated but back in February 2013 on Fifteensquared they seem a bit concerned about 6d? An enjoyable challenge from Klingsor. A lot of the grid fell very quickly, but the last third held out for long enough to push this into an above par time. One or two I couldn’t parse, including 22d, though thankfully that was a name I knew. 20ac I thought a little unfair – wordplay that was quite tricky, and a definition that meant nothing if you didn’t know Klingsor’s real name, which I didn’t. 14ac required a trip to Google because, well, my knowledge of the periodic table isn’t that good. COD? 10ac – ‘”Sorry I lied first of all” admits (almost) Conservative leader (9)’. Our usual mid-week treat from Dac that I found to be on the easyish side, though with fewer write-ins than usual, perhaps. If that isn’t a contradiction. A few unknowns for me – 12ac and 17d – but the wordplay couldn’t have been any clearer. Some discussion over on the other side regarding 20ac, but the blogger’s explanation looks fine to me. Hands up who was trying to remember who wrote Tintin when they first looked at 16ac. COD? 3d – ‘Learner who is working to become wise (6)’.